I wrote earlier how many in Austria-Hungary never got civilly married until long after their religious marriage or never got civilly married at all. But that wasn't the case for my great grandparents, Josef and Esther (nee Rutner) Joshowitz. 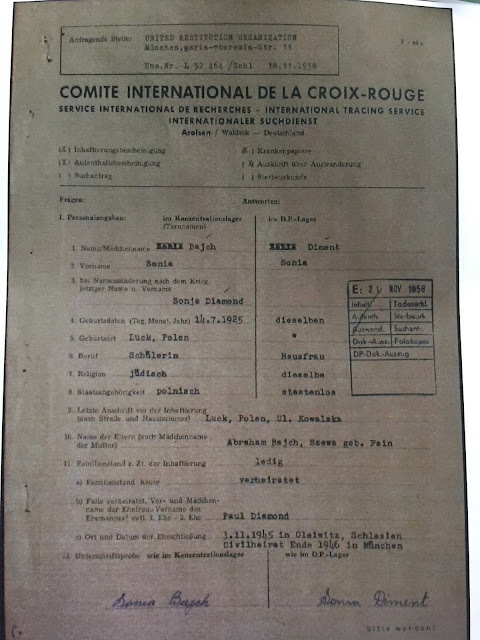 Post-Holocaust, the International Tracing Service of the Red Cross collected information from survivors such as my grandmother, Sonia Diamond, so that if someone else were searching for them, their current location would be known. (Nowadays, Facebook would make this a much more simple task!) My grandmother filled out forms in 1959 that gave information about herself, including her location pre-war, during the war, and in 1959. Earlier, I posted about a Settleman gentleman who believed that he was related to my Suttlemans--and some of the circumstantial evidence seemed to back that up. To try to get more evidence, Mr. Settleman took a DNA test. His initial FamilyFinder (autosomal) results didn't look very promising for a connection, but his Y results weren't in yet. But now they are. Many Jews living in the Austria-Hungarian Empire, particularly Galicia and Maramaros, either never were legally married or only got legally married when it was necessary. The couples had Jewish ceremonies and they and their communities considered them fully married. However, the government didn't, leading their children to be considered illegitimate and called by their mother's (maiden) surname. My great-great grandparents (Shmuel Moshe and Rochel Fuchs Rutner) were having children together by the 1881. However, the fact that they weren't legally married led to their children being considered as born out of wedlock. Earlier, I'd looked at the Settleman family, which claims to be related to my Suttleman family. The naming patterns seemed to back up their story--Pesachs and Efrayims in both my Suttleman and this Settleman family. Mr. Settleman also remembers meeting some of my grandfather's half aunts and was told they were cousins. We were guessing that he would be a second or third cousin to my grandfather. So Mr. Settleman took a DNA test to put the questions to rest. His FamilyFinder (autosomal) results are back. I had hoped/expected that known Suttleman descendents would be near the top--but they were not. But how well did they match? I was wrong; I admit it. Last month, I posted about how I'd just discovered my great-great-great grandparents' names, including my ggg grandmother's maiden name. They were listed as Hers and Roza Motyovics Eizikovics on my great-great grandmother's death record, so I dutifully added those names to my family tree and list of ancestral surnames. Back in October, I wrote about my grandfather's International Tracing Service (ITS) records that I'd received after waiting for a year. Rather than waiting another year to see what they had on my grandmother and great grandmother, I went to the Holocaust Museum in Washington, DC, as they have direct access to ITS records. When I noticed that they were able to find significantly more on my grandmother than ITS had found on my grandfather, I asked them to search for his records as well--and they found additional information on him! I knew my great-great-great grandparents' names--Mendel and Itta (nee Farkas) Rutner from their son Shmuel Moshe's birth record. 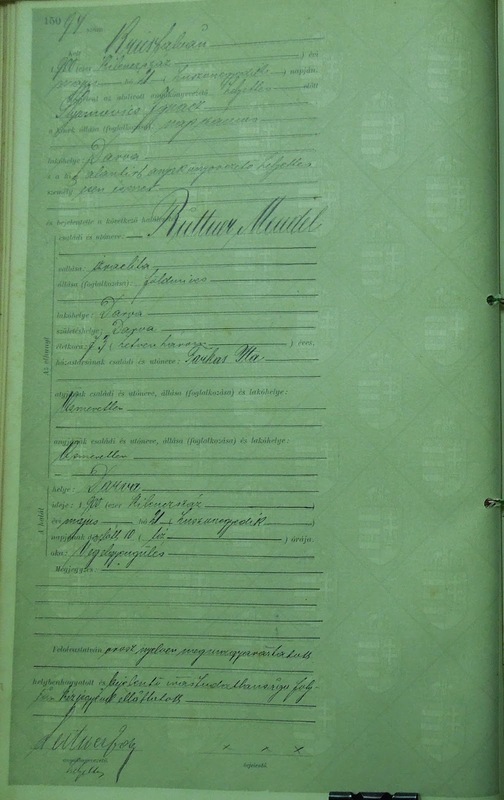 I knew that Mendel likely lived in Kolodne (then in Austria-Hungary; now in Transcarpathian Ukraine) and probably died there. I am not positive who his parents were, although some distant cousins believe they know at least the father's name. But a death record should help with that, right? Less Than One Month to RootsTech! 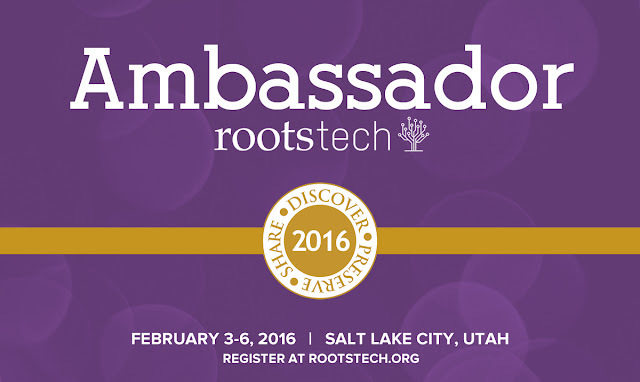 In a bit under a month, I'll be at RootsTech 2016! Will you be there as well? It isn't too late to register for what promises to be a jam-packed conference. Besides the 250+ scheduled sessions targeted to those with genealogy skills from the most basic to most advanced, there have been a number of exciting keynote speakers announced, with more to follow. Who's already been announced?